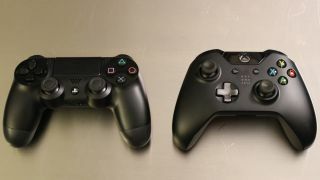 Developers are busy in their gaming labs, wearing their gaming labcoats, harnessing the potential of the next-gen systems right now, but one of them isn't convinced that the PS4 and Xbox One will ever have power parity. Speaking in an interview with Xbox Achievements in March, Oddworld creator Lorne Lanning suggested that we'll see the gap between the two systems close. Turns out, he was misinterpreted. Just Add Water CEO Stewart Gilray told Worlds Factory the reality is quite the opposite. "What he meant when speaking to that guy was that budgets, schedules and perceivable differences would narrow," he said. "Not that the Xbox One performance is improving to align with PS4, that is just physically impossible." Gilray went on: "The PS4 has more compute units and faster memory and a whole bunch of things that would make that physically impossible to happen." That all said, we do expect we'll see the One get a graphical enhancement once Microsoft releases its new DirectX 12 drivers, even if the real limitations still lie in the hardware. But graphics aren't everything. What do we think of the Xbox One?